John Francis Snow was born in Burlington, Middlesex, MA, about 1820, he married Charlotte Lucretia Reed there on 19 Sep 1839. His whereabouts are unknown to me until the middle 1840’s when he opened a book stand in nearby Boston for a few years. By 1849 Snow landed a job as a policeman in Boston, even though he is listed in the 1850 census as a “trader”. In 1852 he gave notice that he was leaving his job, and Boston, for California. The Boston Daily Atlas of 14 January 1852 reported, "On Monday evening, Mr. John F. Snow, an officer of the Washington Associates, Ex-3's, and also a police officer, who is about leaving with his family for California, was presented with a splendid revolver by the Associates, through Capt. A. F. Bressey". Snow apparently headed straight for Marysville, CA, for he and Charlotte are listed there in the 1852 census, which was scheduled 12 June 1852. He soon got a job as the jailer for Yuba County. A rather startling jailbreak in 1853, that even involved Charlotte, probably gave him pause about the safety of his job. Charlotte was reportedly seriously injured and awarded the sum of $100 for her heroism in attempting to stop the break. John and Charlotte left California perhaps by 1857, but certainly by 1860 he and his wife were back in their home town of Burlington, MA, where he was listed as a farmer. Nevertheless, he again left for California, this time heading for San Francisco, arriving there on 19 October 1864. He was advertising his dyeing works there in early 1865. The 1865 San Francisco directory listed Snow as, "coloring and cleansing gloves, silks, feathers, and agent patent medicines". While his ads list all the dye services he offered there is no mention of hair dye of his own manufacture at that time. 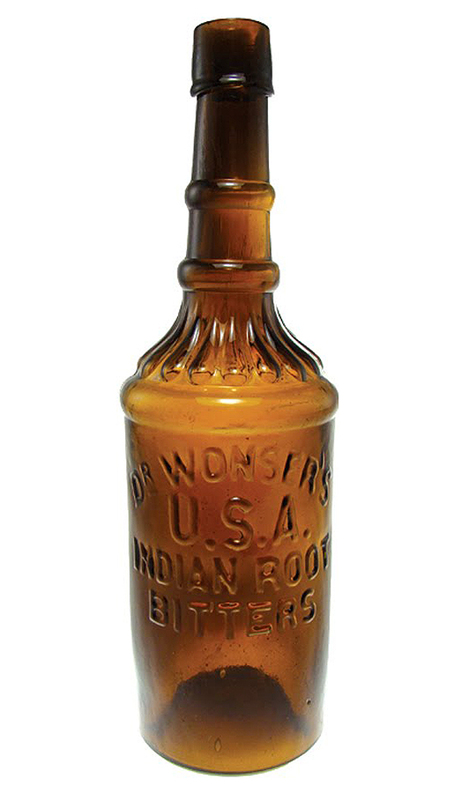 Snow did function as an agent for Ring’s Vegetable Ambrosia as early as 1865, which was an Eastern made hair restorative, and in the early 1870’s he was agent for Connell’s East India Remedies (The Moon Plant bottle with the feet embossed). He continued in the dyeing and cleaning trade for a number of years, apparently quite successfully. Snow also dabbled in real estate and investment mining. By 1880 he sold his business to his partner, Charles J. Holmes. In the sale of the business Holmes also purchased the right to use his old partner’s name, “John F. Holmes & Co.”. But within two years Snow constructed a building directly in front of, and on the same lot as his old business. Needless to say, Holmes was steaming mad and took him to court. This began legal squabbling that lasted for years. Snow was able to gain his old business name back and continued in the dyeing trade until he died, in San Francisco, on 10 June 1897. Charlotte continued the business until she died there in 1904. They had no children. The 1874 business directory advertisement for John F. Snow’s VICTORY. became involved with the Centennial Exhibition as he was chosen as a delegate to judge San Francisco companies who wished to participate in that grand showing of this country’s wealth and ingenuity. After the termination of the Fair, John and Charlotte also took a long vacation back to Burlington, MA, to celebrate their 50th wedding anniversary in 1879. The Snow's has been found in privy's dating from the mid 1860's and also from privy's dating to the 1870-71 era. Warren Friedrich has pointed out that if you look at the Snow's bottle, and the Dr. Wonser's cylinder, the letter font is identical even including the apostrophe on both bottles. The majority of these bottles known were all dug from the same privy in Marysville. City records indicate the property was owned by John Snow.